This HDMI extender splitter includs one transmitter and two receivers, extend 1 HDMI source to 2 HDMI displays over single CAT6/6a/7 cable up to 50m/164ft. The highest resolution supported is 1920×1080@60Hz, and it supports IR passback, EDID pass through and only one power adapter for the transmitter is needed,the Receiver is powered by the transmitter over CAT6 cable. Ideal solution for HDMI exhibition, Video conference and show center, ect. 1.Distribute 1 HDMI source to 2 HDMI displays over network cable simultaneously. 2.Compatible with CAT6/6a/7 network cables. 3.The transmission distance is 50m/164ft. 4.The Highest resolution is up to 1920×1080@60Hz. 5.Support 20~60Hz IR pass back. 7.Support power from transmitter to receiver unit over the CAT6 cable. 1.HDMI source device(computer graphics card, DVD,PS3, HD monitoring equipment etc). 2.HDMI display device like SDTV, HDTV, and projector with HDMI port. 3.UTP/STP CAT6/6A/7 cable, follow standard IEEE-568B. 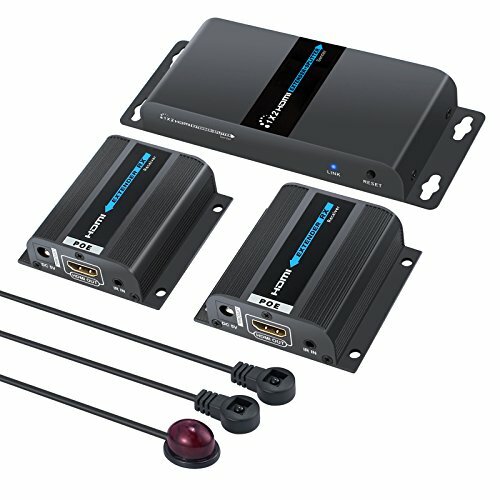 【2 Port HDMI Extender 1 In 2 Out】 Included 1 Transmitter and 2 Receiver, Distribute 1 HDMI Source to 2 HDMI Displays over Network Cable Simultaneously. 【IR Remote Control】Support 20~60Hz IR Pass Back, Control a DVD Player or Other HDMI Video Source from a Remote Location with the Included IR Cables that Forward Commands over a Dedicated DDC Channel for Convenience and Security. 【HDMI Loop-out for Local Display】HDMI Transmitter is Equipped with 2 Port HDMI Splitter. Additional HDMI Output on the Transmitter to Connect to a Local Display for Monitoring. Easy-to-follow EDID Configurations via DIP Switches. 【High Resolution Over CAT6/6a/7】Compatible with CAT6/6a/7 Network Cables. The highest Resolution Supported is 1920×1080@60Hz, Ideal Solution for HDMI Exhibition, Video Conference and Show Center, ect. 【Up to 40m/131 Feet】Extend Any Audio/Video HDMI Connection Up to 131 Feet over Cat6/6a/7 Cable, Suitable for Digital Signage, Houses of Worship, Classrooms, Boardrooms, Conference Room Projectors, Gaming, Video Production and more.